My answer was “Yes.” Because even if every shelter embraced the No Kill philosophy and the programs and services that make it possible, even if no dog or puppy was killed in a shelter again, we’d still want to close down puppy mills. You don’t have to believe in or perpetuate the lie of pet overpopulation to work on efforts to curtail harm to dogs in puppy mills. 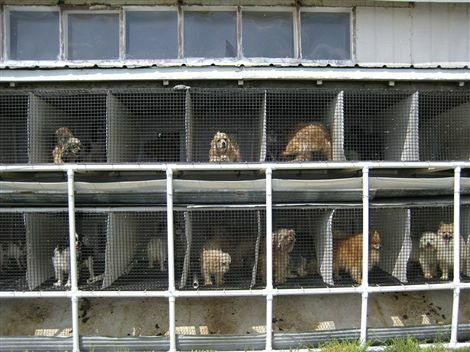 Puppy mills fuel inbreeding, provide minimal to no veterinary care, lack of adequate food and shelter, lack of human socialization, overcrowded cages, and cause neglect, abuse, and the killing of animals when they are no longer profitable. That is a distinct and separate harm from the fact that shelters are needlessly killing them. The animal protection movement is a wide and varied field. While some of us are focused on stopping “shelter” abuse/killing, others of us are focused on stopping puppy mill abuse/killing, and still others are working in other areas, we are all working to prevent harm to dogs (and other animals). True dog lovers embrace the No Kill philosophy because they want to prevent harm to dogs, such as their systematic slaughter in shelters. True dog lovers also want to shut down the puppy mill trade because they want to prevent harm to dogs, such as their systematic abuse. That is ethically consistent. To claim to want to shut down puppy mills, but to ignore or fight reform efforts to stop shelter neglect, abuse, and killing (as groups like HSUS and PETA do) is not only ethically inconsistent, it is morally bankrupt. PETA claims to want to stop puppy mill abuse but will defend the exact conduct if it occurs in a shelter. HSUS claims to want to stop puppy mill abuse but will give awards to shelters that sadistically abuse animals. Neglect is neglect, abuse is abuse, killing is killing regardless of by whose hand that neglect, abuse, and killing is done. To look the other way at one because that neglect, abuse, and killing is done by “friends,” “colleagues,” or simply because the perpetrators call themselves a “humane society” is indefensible.